Tag line: "Barbaric Splendor - Gasping Magnitude - Adventure !" Trivia: The battle between the Thuggees and the British Indian army was added when RKO considered the original ending too bland. 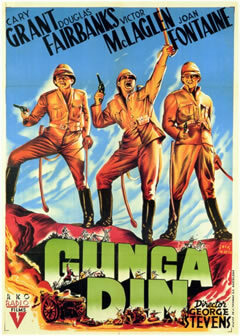 When director George Stevens first read the script for Gunga Din, he was shocked to learn the majority of the movie, which centered on a famous 19th century battle in British India, was slated to be shot indoors. Relying on his instincts, Stevens went to the execs at RKO and said “I need a half million dollars to take this story outside”. The studio agreed, and Stevens brought in some additional writers to make the necessary script adjustments. It proved to be a masterstroke. With action and excitement at every turn, there wasn’t a sound stage in all of Hollywood that could have contained this movie. Sgts. Cutter (Cary Grant), MacChesney (Victor McLaglen) and Ballantine (Douglas Fairbanks Jr.) are loyal British soldiers stationed in India. All three are willing to lay down their lives for Queen and Country…as long as they can have a little fun while doing so. When Ballantine announces he’s leaving the service to marry Ms. Emaline Stebens (Joan Fontaine), his comrades convince him to sign on for one last mission, one final adventure before packing it in. So, it’s off to Tantrupar, where a Hindu cult known as the Thuggees are planning an uprising against the colonial English government. The regimental water carrier, a native known to the men as Gunga Din (Sam Jaffe), has always wanted to be a British soldier, and before the battle with the Thuggees is out, he may just get his chance. Gunga Din’s action scenes, as staged by director Stevens, are spectacular. In one early battle, the three sergeants, despite being heavily outnumbered, decide to take on the opposing forces all by themselves. They start out with a little hand-to-hand combat before moving to the rooftops, where they exchange gunfire with the army below. While on this roof, the three discover a cache of dynamite, and it isn't long before they’re tossing it into the enemy ranks, taking out large pockets of their forces while blowing up half the town in the process. Once they’ve done all they can, Cutter, McChesney and Ballantine make their escape by jumping off a huge cliff and landing in the river below, thus guaranteeing that, in spite of the odds, they'd live to fight another day. Effective as an action story, a buddy movie, and a humorous look at military life, Gunga Din is still, all these years later, an extremely entertaining film.